Wild strawberries are tiny but incredibly sweet and full of flavor nuances that are missing in the massive cultivated varieties we buy in stores. 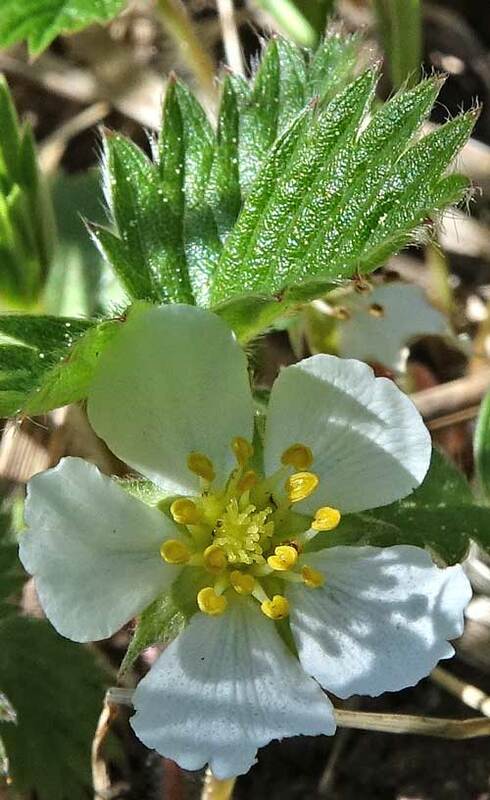 The store varieties did, of course, start from wild strawberries; they are hybrids of our common Fragaria virginiana and Fragaria chiloensis, a species that ranges the Pacific coast from Peru to British Columbia. 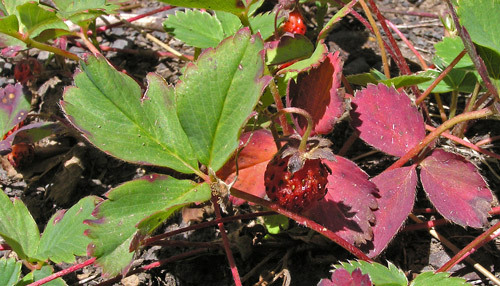 Linnaeus named this genus in 1753, giving it the classical Latin name for the strawberry plant. 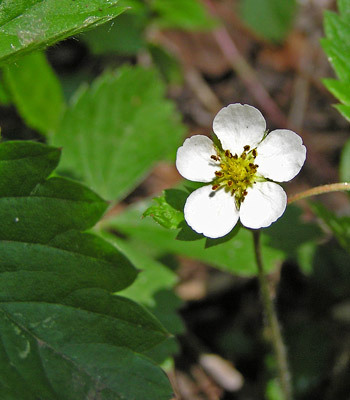 In 1753 Linnaeus also named Fragaria vesca, the first species below. 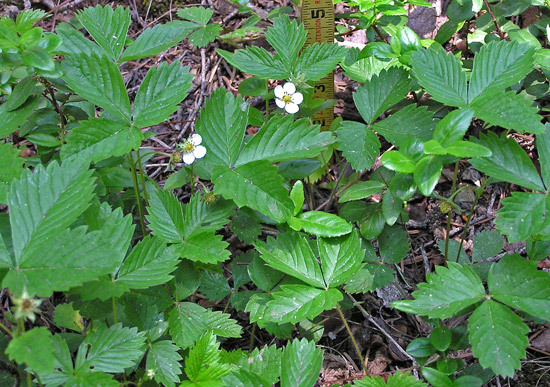 In 1768 Phillip Miller named Fragaria virginiana. 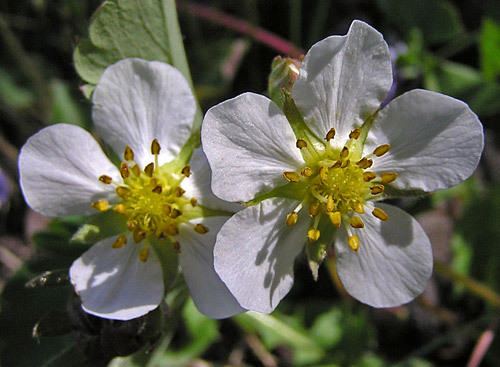 "Fragaria' is from the Latin "fraga" which is our English "fragrant". Montane, subalpine. Meadows, openings. Spring, summer. Above: Vallecito Creek Trail, June 2, 2016. Left: West Mancos Trail, June 26, 2004. By far the less common of our two species of wild strawberries, Fragaria vesca still can often be found through the mountains. Along some trails, e.g., the Vallecito Creek Trail, it is, in fact, very common. 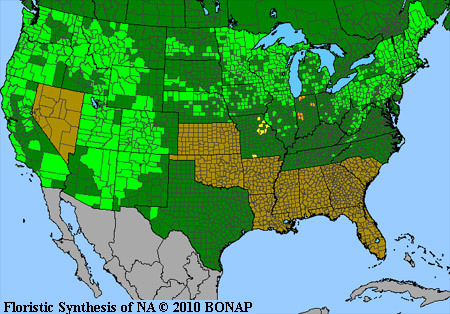 West Mancos Trail, June 26, 2004, June 17, 2010, and October 9, 2008. Fragaria vesca leaves are prominently veined, serrated, and mucronate. (A "mucro" is a minutely pointed tip -- visible on the leaves in the top photograph at left). Occasionally one finds F. vesca and F. virginiana growing near each other. 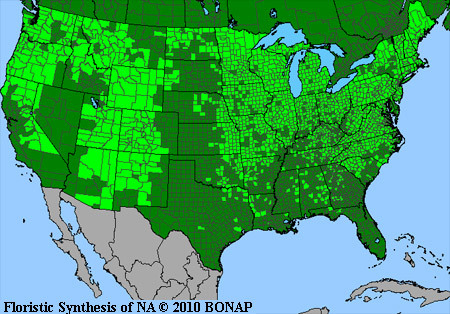 F. vesca leaves are typically bright green, prominently veined, and more deeply toothed; F. virginiana leaves are blue-green with subdued veining, and more shallow serrations. 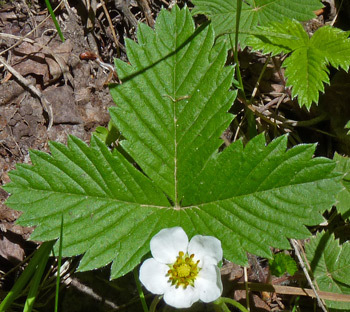 Fragaria virginiana is a very common ground-hugging plant with prominent leaves, conspicuous flowers, and incredibly sweet, tiny red berries. The berries are, unfortunately, so treasured by wild critters that we humans get only a few. F. Virginiana sends out red runners to reproduce itself and is thus found in patches (often large). 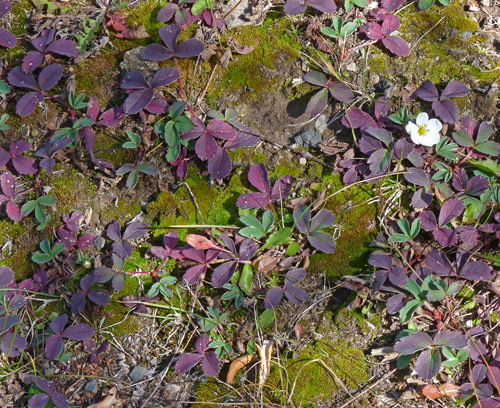 It blooms from early spring until frost in low meadows, open woods, hot barren slopes, and high subalpine areas. 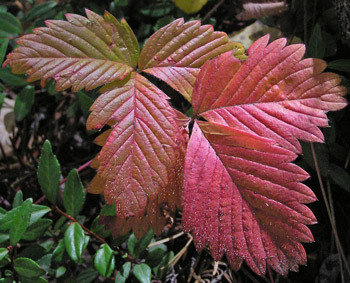 Its leaves turn lovely shades of reds and maroons in the fall. Shearer Creek Trail, May 17, 2006, El Diente Trail, August 29, 2005, and Upper West Mancos Trail, October 1, 2010. 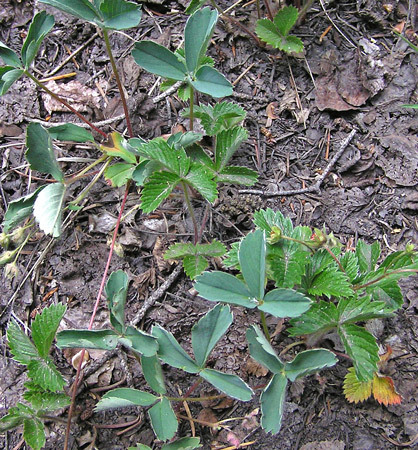 Bright white flowers give way to berries and then green leaves yield to fall colors. Berries are typically about one-third of an inch in diameter and have far more interesting and varied qualities to their taste than do domesticated strawberries. I can tell you for sure that the berries in the middle photograph were fabulous tasting. And so were the many other ripe Strawberries that Betty and I were lucky enough to find on the El Diente hike. The final photograph gives a view of the lovely fall colors from three feet above the plants. 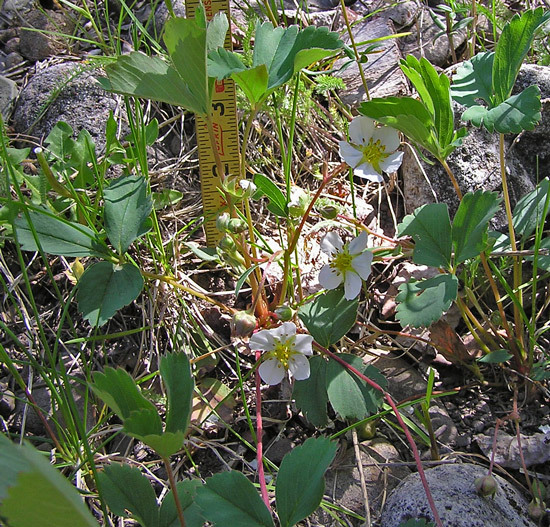 Fragaria virginiana is a very common plant in the mountains of the Four Corners area and the lovely colors shown are common along miles of trail.